Community Shared Agriculture | Mmm, Tasty! 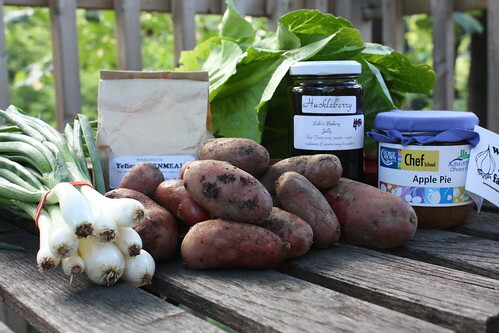 This year Rich and I decided to do a summer CSA. After doing a fair bit of research into what was available in the Toronto area, we decided to go with Kawartha Ecological Growers (KEO). We liked their share size options (large, small or mini) and we loved the way they set theirs up – you get a core list of produce from what was harvested that week, plus a small amount of money to spend on whatever you like that they have with them that day, including more vegetables or fruit, herbs, meat, eggs, flours, jams and preserves, maple syrup… anything that their farms produce and is either in season or is jarred from previous seasons. In our case, we have a small share, which means $15 worth of vegetables and fruit that they choose and $10 of whatever we want. We also love the fact that they are a grassroots organization of farms – yes, more than one farm. That means that if one farm has a bad year (always very unfortunate! ), you will still get plenty of goodies from your share, as it is very unlikely that all of the farms will have a bad year at the same time. Last week we had our very first pickup, from the garage attached to the back of Linuxcaffe (Grace at Harbord). How great is that? Everything we’ve eaten so far has been wonderfully fresh and delicious. Plus, this has been a great way to plan our meals for the week – instead of randomly choosing dishes, we’re looking at what we have from the CSA this week and getting creative with the ingredients. I’ll share some recipes I’ve made from our haul throughout the summer!